For only the second time in the last 10 years, more than half of new home communities raised prices (according to our monthly survey in June of more than 20% of new home communities in the country). Note the steady change in green (price increases) since 2014 after the hockey-stick recovery in 2012–2013. Each month, the survey I have managed for the last nine years tells the story well. Builders raise prices when they feel confident about their sales pace and employ incentives or discounts when sales slump, which reduces the net home price. The graph above reveals the housing recovery’s path quite well. Declining prices in 2008 and 2009. The $8,000 federal first-time buyer tax credit could not stabilize home prices, as builders struggled to compete against foreclosures and appraisal values kept sinking. The tax credit did help sales volume at entry price points. Weak demand and prices post-tax credit in 2010. New home prices weakened following the April tax credit expiration, especially in secondary locations targeting entry buyers. Foreclosures peaked nationally in August 2010. Incentives contributed to price declines in 2011. 32% of builders reduced prices month over month in 2011, relying on incentives to drive additional sales. Sales concessions averaged 11% of gross price nationally. Single-family starts bottomed at 426,100 units in 2011. Tight supply propelled new home prices in 2012. New home inventory bottomed at 142,000 units nationally. Investors buying up distressed resale inventory for rentals established a price floor. Lack of labor became an issue for the first time. Price increases on steroids in 2013. 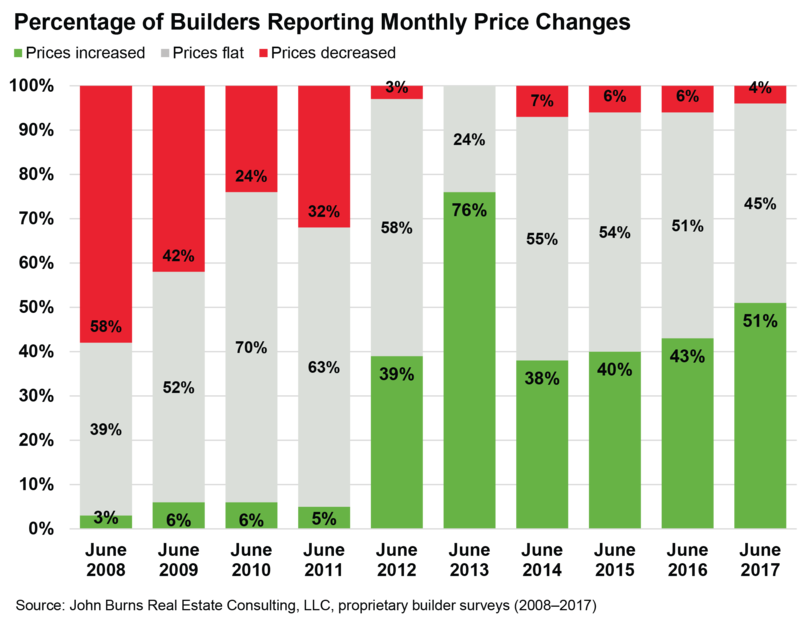 76% of builders raised prices in June 2013, as an exceptional spring selling season paired with finished lot and construction labor shortages produced significant upward pricing pressure. Some builders increased prices weekly to slow sales until construction could catch up. Price increases moderated in 2014 and 2015. Double-digit price increases in 2013 eased as lower FHA loan limits paired with higher mortgage rates and home prices stalled demand for new homes. We called out Phoenix, Las Vegas, Inland Empire, Sacramento, and Tampa as markets that had improved too dramatically in 2013. Affordability begins to restrict price increases in 2016. Builders maintained incentives to motivate hesitant buyers, while another federal budget standoff loomed. Builders rated high new home prices, especially compared to resale prices, and problems qualifying for larger mortgages as top concerns in our survey. Spring sales and higher costs boost prices in 2017. Last month, 51% of builders raised prices—the highest rate since the rapid price recovery in 2013. Continuing sales strength, spread across buyer segments, and rising materials and labor costs motivated builders to boost prices. An extensive timeline is available on our website. For more 2008–2017 housing sector milestones and insights from our builder survey and other research, click here. Planning for housing’s next phase. Our clients benefit from an early and accurate read on new home market trends from our national builder survey analysis just days after each month ends. If this insight can help you, please contact sales@realestateconsulting.com. We are always seeking new survey participants. 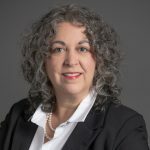 Production volume builders interested in participating in our survey should contact Jody Kahn at (603) 235-5760 or jkahn@realestateconsulting.com. Participants receive the full survey analysis and complimentary metro data including our forecasts.